Let’s cut right to the hyperbole: The 2017 Chevrolet Camaro SS 1LE is a rolling manifestation of Bruce Springsteen’s most celebratory lyrical fairy tale, the “all-American boy with a nose for trouble finds his way by means of a pushrod-V-8–powered muscle car with a weary-but-naturally beautiful girl in the passenger seat.” Born from the same humble two-door-coupe blueprint that launched the Camaro 50 years ago, it’s the everyman’s super-Camaro: a 455-hp, apex-craving monster that rings in with a $44,400 base price ($6500 for the SS 1LE Performance package on top of $37,900 for the 1SS coupe). 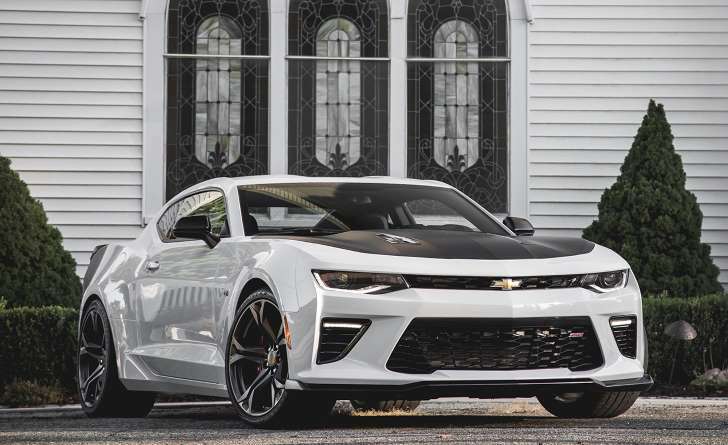 That’s $16,435 less dear than the expected $62,135 sticker for the 2017 Camaro ZL1, and it will likely undercut the price of the upcoming 2018 Camaro Z/28 by even more. Before we get into the nitty-gritty details of how this hit parade of Chevrolet performance parts translates into test results, let us remind you of how well this sub-$50K Camaro SS 1LE performed at this year’s Lightning Lap competition at Virginia International Raceway. In Turn One, its 1.11 g of grip matched that of the Ferrari 488GTB, and in the uphill esses it managed a higher average speed (121.6 mph) than the McLaren 570S. Do we really need to tell you how many 1LE Camaros you could buy for the price of either of these exotics? Ultimately, the Camaro posted a lap time of 2:54.8, earning it a second-place ranking in the hotly contested LL2 class ($35,000 to $64,999). With all those racetrack heroics in mind, let’s take a look at how the 1LE faired in our standard round of tests: The zero-to-60-mph run consumed 4.1 seconds, and the quarter-mile arrived in 12.4 seconds with the car clearing the traps at 116 mph. Although the Camaro was equipped with launch control, our drivers beat it by utilizing old-fashioned reflexes, launching the car with the engine spinning around 2000 rpm for the best results. While the numbers are impressive, they don’t relay how innocuous the SS 1LE can be in day-to-day driving. Sure, the Recaros are snug, but they leave enough room for your limbs to move about and take care of business. The compromised outward visibility makes it somewhat difficult to place the car on the road, but most staffers eventually acclimated to the environs.